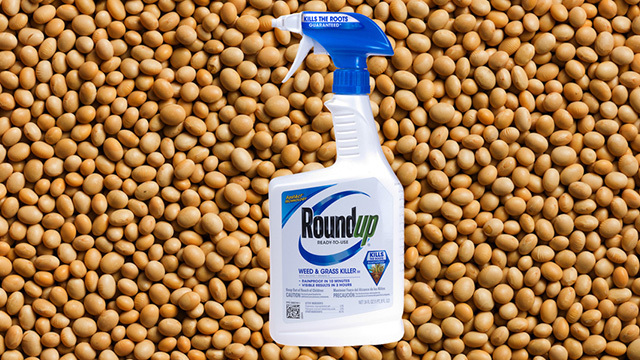 Glyphosate residues in GM Roundup Ready crops are largely ignored in studies used for GMO regulatory safety assessments, according to a new review published in Environmental Sciences Europe. The review also found that all but one of the animal feeding studies performed by researchers independent of the GMO industry found significant effects in animals fed GM Roundup Ready feed. Overview shows glyphosate residues are "ignored issue"
The review looked at 30 published reports: 15 were compositional analyses of Roundup Ready crops and the other 15 were animal feeding studies with these crops. • Only one of the 30 studies analyzed the material for glyphosate residues. In short, the review concluded that glyphosate herbicide residues are an ignored issue in GMO composition and animal feeding studies. Of the 15 animal feeding studies with Roundup Ready crops, 6 were performed by industry-affiliated researchers. The remaining 9 studies were performed by researchers in government agencies, universities or other institutions assumed to be independent of the GMO industry. Of the 6 studies performed by industry, plant material for feed was produced with application of glyphosate herbicide in only 3 studies (50%). In the 9 independent studies, plant material for feed was produced with application of glyphosate herbicide in 5 studies (56%). Unfortunately, no information on dosage was given in any of these studies (100%). Only 3 of the 9 independent studies reported that relevant pesticide analysis was performed. Of the 6 industry studies, only one reported that pesticide analysis was performed. However, although glyphosate herbicide was the only pesticide applied in this study, the subsequent analysis measured numerous pesticides – but not glyphosate or the main metabolite of this chemical. The author of the new review commented that due to these "obvious shortcomings", none of the six industry studies included analyses for relevant pesticides. Based on the data from test animal performance and histology, the review states that 7 out of 15 studies found no significant effects from GM feed (produced from glyphosate-tolerant plant material). These 7 studies included one of the independent studies and all 6 industry studies. The remaining 8 independent studies did find significant effects from GM feed produced from glyphosate-tolerant plant material. In the 8 studies reporting significant effects from GM feed, 2 studies related these effects to residues of glyphosate. One of the studies found that test animal growth and reproduction decreased as glyphosate residues increased. The review found that industry tests of GM crops for regulatory assessments often fail to apply glyphosate herbicides in line with normal farming practice and fail to measure glyphosate residues. The author states that crucial data from compositional analyses and animal feeding studies submitted to regulatory bodies as evidence as safety are not representative of the GM crops actually produced by farmers and delivered onto the commercial market. In other words, the regulators are looking at irrelevant materials. The author concludes that industry tests on such materials do not meet acceptable scientific standards and that therefore "Such evidence should be disregarded and demands for new evidence should be brought forward". This new evidence, the author adds, should be supplemented with independent research; alternatively, industry tests should be "competently supervised" to ensure that proper scientific standards are met. Cuhra, M. (2015). Environmental Sciences Europe, 27(1), 1-14. Genetically modified glyphosate-tolerant cultivar varieties have been a commercial success widely known as Roundup Ready plants. As new glyphosate-tolerant varieties are introduced to satisfy agriculture demand, it is relevant to review the scientific evidence that documents the quality and safety of such biotechnology. Assessments of genetically modified glyphosate-tolerant plants are partly based on the reports from laboratory comparisons with non-modified plants (near-isogenic relatives). Such comparative testing is typically performed as analysis of plant material composition and in animal feeding studies. The material for testing is typically produced in test-fields set up as model environments. Most of this research is planned, performed and reported by researchers employed by biotech industry companies. The present paper aims to: (1) review 15 reports on compositional analyses of glyphosate-tolerant cultivars and 15 reports from animal feeding studies, (2) discuss recent data indicating glyphosate residue in Roundup Ready soybean, (3) outline recent developments of cultivars with increased tolerance to glyphosate. The reviewed industry studies show methodological flaws: glyphosate-tolerant GM crops are designed for use with glyphosate herbicide. However, glyphosate herbicides are often not applied in test-study cultivation. In the studies where glyphosate herbicides were applied to growing plants, the produced plant material was not analyzed for glyphosate residues. This review has failed to identify industry studies that mention glyphosate residues in glyphosate-tolerant plants. This indicates that questions and evidence of importance for regulatory assessment have been systematically ignored. Independent research has investigated this issue and found that glyphosate-tolerant plants accumulate glyphosate residues at unexpected high levels. Glyphosate residues are found to have potential to affect plant material composition. Furthermore, these residues are passed on to consumers. Industry studies are not sufficient for regulation. Despite decades of risk assessments and research in this field, specific unanswered questions relating to safety and quality aspects of food and feed from GM crops need to be addressed by regulators. Independent research gives important supplementary insight.